Two children describe the wonderful times they have with their grandmother doing such things as working in the garden, building sandcastles, and going to the movies. - Publisher Ages toddler and upwards. This a story that perfectly illustrates the loyalty and love that grows between a grandma and her grandchildren. Whimsical illustrations bring the characters to life in this gentle world Hallinan has created. 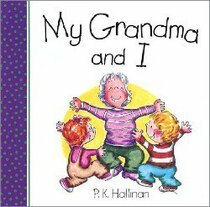 About "My Grandma and I"
Ages toddler and upwards. This a story that perfectly illustrates the loyalty and love that grows between a grandma and her grandchildren. Whimsical illustrations bring the characters to life in this gentle world Hallinan has created. P.K. Hallinan is the author and illustrator of more than 80 children's books with nearly 8 million copies sold worldwide. His book For the Love of Our Earth was recognized by Early Childhood News as one of America's "100 Best Product Picks for Children." He has also had two other books make the "Top Five" of Waldenbooks National Bestsellers list. Mr. Hallinan has been honored by Howard Payne University's prestigious Lorgnette Review for his books, which are enjoyed for the timeless values they share. When he's not writing, Hallinan is an ordained minister and a nationally sought-after speaker.